Laser hair removal services provides more permanent removal of body hair than waxing or shaving. We are proud to offer laser hair removal for all skin types using the Candela Gentlelase and the Cutera Xeo lasers. 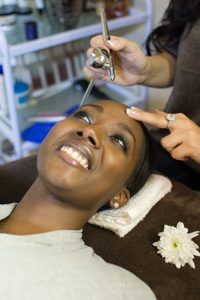 It usually requires a series of treatments to achieve permanent results. Try this innovative technology if you are ready to permanently say goodbye to that pesky, unwanted body hair. Enjoy a spa facial and experience the luxurious feeling of deep-down clean. Our esthetic staff will apply facial products to exfoliate and cleanse your pores, balancing your skins natural oil content and leaving you feeling refreshed and invigorated. Laser skin and vein treatment services to give your skin a beautiful and even look. Reduce the appearance of rosacea, age spots and wrinkles, and achieve long-lasting results to beautify your skin. Medical body services to improve your health and your look. Signature salon massage is a traditional massage modality which employs effleurage (stroking) and percussion techniques. This is the classic massage style that has proven effective for years in providing stress relief, pain reduction, and increased mobility for trouble spots. Be sure to mention if you are suffering from any injuries or skin conditions before scheduling this service. Please call (903)927-6880 or email claritymarshall@gmail.com for our appointment policies.